On Saturday 13th July, when you come along to Hand in Hand – our 30th anniversary festival, you won’t just be watching us Pinkies! 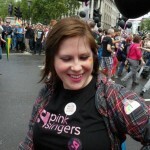 We’ll be joined by a whole host of other LGBT choirs from around the country. Over the next week or so we’ll be posting a series of spotlights on each of the choirs you’ll be able to come along and see performing. Not got your ticket yet? Buy yours now! They’re going fast! First on our tour of the LGBT choirs from around the nation, it’s those lovely chaps from the seaside, the Brighton Gay Men’s Chorus! 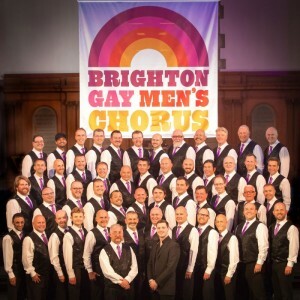 Brighton Gay Men’s Chorus was established in 2005 when a small group of friends who loved singing decided that Brighton should have a gay male voice choir. Starting with around 10 members, the Chorus has grown steadily over the years and now has approximately 80 members. The Chorus works by its three principles of Singing, Socialising and Support. Whilst being a registered charity in its own right, Brighton Gay Men’s Chorus support numerous local charities and perform at many charity and community events in and around Brighton. The Chorus stages at least three main shows a year: usually during the Brighton Fringe Festival, Brighton Pride and at Christmas. Their annual “Pull A Cracker” Christmas show at Brighton Dome is a season highlight, where the Chorus play to almost 1500 people and perform with special guests which have included Eastenders actress June Brown. Other notable successes over the years include performing in the live shows of BBC’s ‘Last Choir Standing’ in 2008, releasing their anti-homophobia single ‘You Make Me Proud’ in 2012 and, most recently, being crowned winners of the 2013 Manchester Amateur Choral Competition. And, hot of the press – they’ve just won the Golden Handbags award for best LGBT Community Social/Leisure Organisation! Brighton Gay Men’s Chorus hopes that in sharing the joy of music with the public they can make the world a better place by brightening people’s lives, challenging the prejudices that still exist today and raising awareness of the issues at the heart of our communities.